This level has medium difficulty. 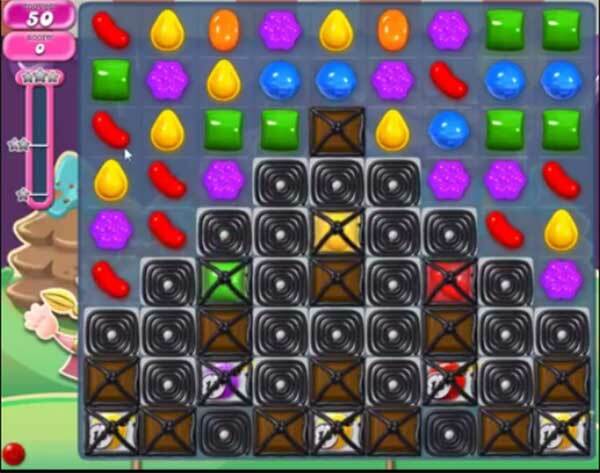 For this level try to play from the bottom or make special candy as you get the chance. Combine special candies with each other or play with remaining jelly candy to break them all. And how many of you out there have this kind of “exploding” board??? I have been playing this for over two weeks and even using boosters, to where I don’t have any left, haven’t gotten close to clearing the bombs, let alone the board. Will give it another week, maybe, and then I am through! I am getting a new puppy and I think he deserves my attention, not an IMPOSSIBLE CC board! I’ve been playing this level for 4 days now and I haven’t even come close to getting the bombs before they explode. I don’t even know of a booster that could conceivably help, unless maybe two chocolate bombs together would rid the board of the bombs. The licorice muffles any striped/wrapped explosion, same with chocolate-striped effects. Just another one where u have to wait for a lucky board to pass through. CC is consistently making those now. Very boring, not strategy involved. I agree it’s no fun when you know there is no ligament way to beat it. Disgusting level. Only 40 moves unlike 45 in the example shown. What crap is this? Solely dependent on luck like many of the other levels. They are calling this “hard level” I have a better title “impossible level”. This level is impossible!! Not fun anymore!! After spending over a fortnight trying to complete this level I have done it, I guess it was due to a lucky board. Not a very pleasant level. This level is impossible no fun whatsoever can’t even get close ! What the F** 45 moves? I only have 40 moves. Cc change the level any time.thats not the way to promote a game cc.??? Level 1348 is terrible!!! Been at it for 3 wks now. Got it down to 1 jelly left a couple of times but no luck. ? Just another level that candy crush wants to sell extra moves and make money. Greedy. Start flashing.I see absolutely no chance of getting pass this one. I am a novice at this game and used lollypop hammers. have since gone up levels. I’ve been on this level for a month now, and just about ready to give up the game for good! Can’t even get close enough before the bombs go off! Disgusted!